We all know how tempting unhealthy fast food and convenience store snacks can be on a long drive. As a truck driver, you will constantly pass the bright lights of your favorite fast food joints along your route. To ensure that you don’t give in to the lure of french fries, hamburgers, and candy bars, we encourage you to prepare some snacks before you embark and keep a list of healthy treats that you can pick up on the go. For help getting started, check out our list of the best snacks for driving. A recent survey of truck drivers found that many have begun to favor healthier foods. In fact, 44 percent prefer fresh fruit to other snacks (source). Many fruits provide potassium, fiber, and multiple vitamins. 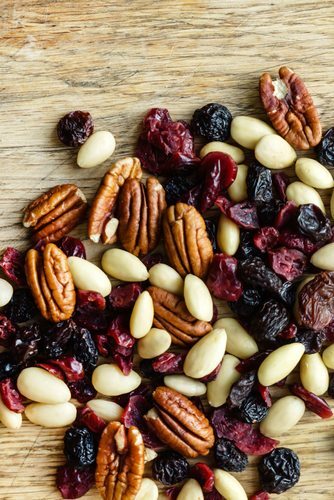 For the greatest convenience, find relatively dry fruits that you can easily peel. Bananas, apples, and clementines are all appealing options. The same survey results show that nuts have become the second-most popular choice for highway snacking. They supply plenty of fiber and boost energy with substantial amounts of protein. Peanuts contain vitamin E and various minerals as well. Other “health nuts” include pistachios, walnuts, and almonds. If you’re worried about sodium, buy unsalted nuts. Dried grapes are sweet but healthier than candy. Consider mixing them with peanuts or sesame sticks. Raisins provide hungry motorists with fiber, calcium, iron, and beneficial antioxidants. They’re also free of fat and cholesterol. Some stores sell them in convenient snack-size boxes. These tasty seeds deliver impressive amounts of protein, potassium, calcium, magnesium, fiber, and iron. You can eat them without making a mess, especially if you buy seeds that don’t have shells. Although they rank among the best snacks for driving, sunflower seeds contain numerous grams of fat. Dried meat can provide a healthy protein source if you select the brand carefully. Choose a natural product with comparatively little sugar and sodium. In addition to protein, this food supplies minimal amounts of iron, fiber, and potassium. It’s low in cholesterol as well. You probably don’t want to wash, peel, and cut full-size vegetables in a vehicle. Fortunately, baby carrots provide a convenient solution. They only measure a few inches long, and you can purchase them in very small bags. These crunchy vegetables come ready to eat; there’s no need to use a peeler. Motorists can easily handle pretzels while driving. Your fingers won’t get covered in grease or powdered flavorings. This snack is a decent source of iron, and it also offers a few grams of protein and fiber. If you read the nutritional facts, you won’t find much saturated fat. Think about buying low-sodium or whole-wheat pretzels for a healthier option. If you can keep them cold, individually packaged cheese sticks make it easy to get more protein, calcium, and vitamin A. You won’t need to slice or reseal this type of cheese. Look for a low-fat product if you have concerns about your caloric intake. This handy snack offers more fiber than regular white crackers and less fat than flavored products. It’s also less harmful to your teeth. You can enjoy these crackers without any toppings or choose to add low-fat cheese, brown mustard, hummus, or peanut butter. You don’t need to sacrifice taste or convenience to better your health. Simply stop by a supermarket, grab some of the best snacks for driving, and hit the road. Not only will these healthy snacks prevent you from gaining excess weight, but they can also improve your energy level and mood. Plus, all of the snacks listed above are easy to eat behind the wheel of a semi. Are you interested in becoming a truck driver? You can learn everything you need to know at the Truck Dynasty Driving Academy, a professional truck driver training program that involves 160 clock hours and four weeks of professional driver training. In addition, current drivers can use the refresher course to sharpen and develop their skills. To get started, please give us a call at 417-831-8188, e-mail us at info@tddallc.com, or contact us online. We look forward to hearing from you! Four Week Training curriculum gets you earning $$ fast ! Classes start weekly, so in just four short weeks you can be on the road to financial security for yourself and your family. With the tremendous need for drivers in the transportation industry, your clean Class A CDL license is a ticket to job security and an above average income NOW, and for years to come. Copyright © 2019 · Truck Dynasty Driving Academy. All Rights Reserved. Truck Dynasty Driving Academy is an Equal Opportunity Employer/program.